Alpha-hydroxy acids (AHAs) exfoliate the skin’s uppermost layer of dulling dead cells while beta-hydroxy acids (BHAs) 'unclog' blocked pores to promote clarity and restore radiance. This is a concentrated formula for those who're used to using acids. Apply as a 10 minute mask, 1-2 times per week in the evening. Supercharged with alpha arbutin (a safe skin-lightening ingredient that reduces melanin production), this high-potency, gel-like serum targets dark spots and sun speckles to prevent new and diminish existing brown patches. Use as a serum each morning and evening. 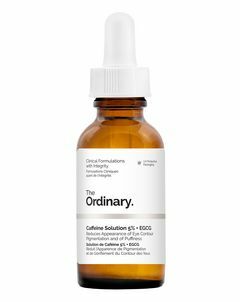 Featuring a high concentration of alpha lipoic acid – a potent antioxidant – this anti-ageing serum helps revitalise lacklustre skin types to improve both tone and vibrancy. Use no more than 2-3 times a week, morning or evening. Dilute with an oil to reduce the likelihood of reactivity (it's concentrated stuff!). Working to inhibit muscle movement (pausing the contractions that cause furrows), this lightweight serum improves visibility of frown lines, 'elevens' and other persistent wrinkles. Ultra-lightweight, apply to forehead and around the eyes ahead of heavier serums, oils or creams. Featuring Ascorbyl Tetraisopalmitate (an oil-soluble derivative of vitamin C) and vitamin F (a potent source of strengthening fatty acids) this gentle daily treatment can be used both morning and evening, to restore vibrancy to compromised complexions. Ideal for city dwellers, this is the perfect way to fortify and shield your face from elemental stress. This multi-peptide serum features a comprehensive array of advanced anti-ageing technologies, including Matrixyl 3000 to stimulate collagen synthesis and hyaluronic acid to plump fine lines and wrinkles. It can be applied daily, morning and evening. A wake up call for skin, this featherweight elixir is an espresso for sleep-deprived eyes. Boasting caffeine and EGCG (a potent polyphenol found in green tea), it delivers a shot of antioxidants and anti-inflammatories to the eye area - diminishing dark circles and reducing tell-tale puffiness. 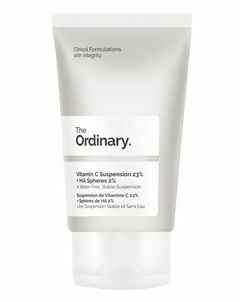 Vitamin C Suspension 23% + HA Spheres 2%: an ultra-active, brightening and anti-ageing antidote. 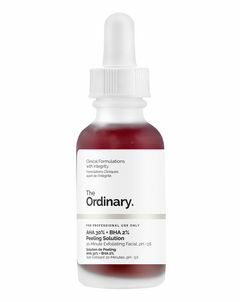 Crafted from vitamin c – in its pure form of L-Ascorbic Acid – alongside hyaluronic acid, this antioxidant-rich treatment brightens and improves uneven skin tone while plumping and hydrating. Use daily in the morning or evening, allowing a few moments for complete absorption. 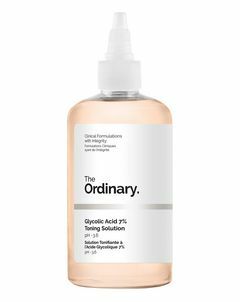 Featuring glycolic acid (an alpha-hydroxy acid that dissolves the 'glue' that binds dulling dead cells to skin's surface) this gentle toning solution offers mild exfoliation to boost radiance and visibly restore skin's clarity. Use once a day in the evening. Offering heroic hydration from hyaluronic acid (with a boost of vitamin B5 to enhance efficacy) this oil-free treatment penetrates deeply, attracting water molecules to leave skin 'plumped' and moisturised with a fresh, dewy feel. Lactic acid (an exfoliating alpha-hydroxy acid) and Tasmanian pepperberry (which reduces signs of inflammation) combine to stimulate cell regeneration, reduce pigmentation and improve overall skin texture. Apply once a day in the evening for maximum, brightening benefit. A water-soluble derivative of vitamin C, Magnesium Ascorbyl Phosphate is an effective antioxidant that brightens the skin tone and helps to reduce signs of ageing – it’s delivered as a lightweight cream. Use daily in the morning and the evening to restore skin's youthful luminosity and lustre. Utilising two ‘generations’ of this miraculous ingredient – Matrixyl 3000 and Matrixyl Synthe'6 – at a combined concentration of 10%, this super-charged serum stimulates collagen synthesis to reduce the appearance of static and dynamic lines and wrinkles, while hyaluronic acid provides superficial 'plumping' to diminish visibility of fine lines. Made up of compounds including amino acids and hyaluronic acid, Natural Moisturizing Factors are elements (often impaired in parched, Sahara-esque complexions) that keep the uppermost layer of skin well hydrated. This non-greasy cream offers a direct topical boost, to 'train' dry skin to become more self-sufficient. This potent serum targets breakouts, minimises visible pores and clears congestion by balancing skin's oil production. Apply to problem-prone complexions, morning and evening before heavier creams. 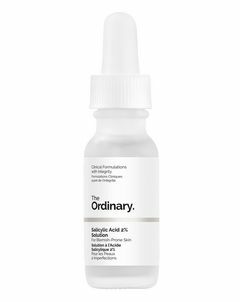 Super-charged with a high concentration of two ‘next generation’ retinoids - vitamin A derivatives which 'irritate' sluggish skin cells to kick-start creation of essential scaffolding: the elastin and collagen which keeps skin strong, supple and resilient. Apply a few drops in the evening, as part of your night-time skin ritual. 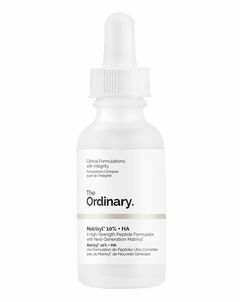 Featuring salicylic acid (a beta-hydroxy acid that successfully 'excavates' embedded grime) and witch hazel, this blemish-battling solution penetrates the interior walls of pores to 'unclog', battle blackheads and help counteract congestion. Use as a targeted on-the-spot treatment or apply all over to maintain a clear complexion. Squalane, a saturated and stable hydrocarbon found naturally in the skin, is an exceptional hydrator that can prevent the ongoing evaporation of much-needed moisture and in turn, maintain skin's suppleness and 'bounce'. that can impair suppleness. Apply a few drops to entire face - or use to protect hair from heat styling.